The rebec (sometimes rebeck, and originally various other spellings) is a bowed string musical instrument. In its most common form, it has narrowboat shaped body, three strings and is played on the arm or under the chin, like a violin. The rebec dates back to the Middle Ages and was particularly popular in the 15th and 16th centuries. The instrument is European and was derived from the Arabic bowed instrument rebab and the Byzantine lyra. 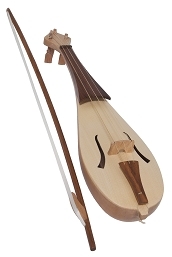 The rebec was first referred to by name around the beginning of the 14th century, although instruments very similar to it had been played since around the 9th century and refered with the term "lyra". A singular distinguishing feature of the rebec is that the bowl (or body) of the instrument is carved from a solid piece of wood. This distinguishes it from the later period veilles and gambas known in the renaissance.